One of Two Family Rooms, tons of light! This five bedroom home sits on top of Baldy Mountain in town in Breckenridge and has some of the best views in the county. Locate a short distance to the lifts and on the free shuttle route. Recently update with new furniture, carpet, and d�cor, this large 3100 square foot home offers the best that Breckenridge has to offer. Two separate living rooms offers space for large groups who also appreciate some privacy. The enclosed, attached garage allows for car and toy storage (skis, bikes, you name it). The lower level of this wonderful home offers a family room with TV and VCR, sofa sleeper, full bathroom, one queen private room, and one double bunkbed private room with TV and VCR. The lower level alone sleeps eight in beds! Take the stairway up to the main level and enjoy the wall of windows that look at Breckenridge Mountain, Main Street, and Ten Mile Range. Truly this home has unobstructed and some of the best views in Summit County. The main floor boast a large 70 inch TV, VCR, DVD, and stereo. Sit back in the large main floor sitting area (family room) or access the large wrap-around deck to see the sites. The private hot tub also sits on the deck where views surround you. This home rests on close to three-quarters of an acre and backs to pure Colorado and tree lined woods. 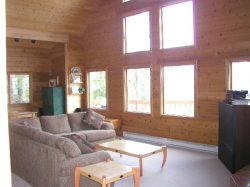 Bike, hiking paths, snow shoeing trails are steps from the back door. Adventure with snowshoes, bikes, cross country skis all steps from this home. Take in the views and enjoy the 104 degree private hot tub that sits on the deck with wonderful views of Breckenridge and Ten Mile Range. 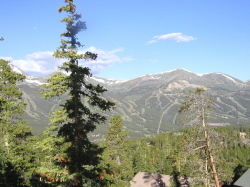 Minutes from Main street and the heart of Breckenridge. Take the free shuttle to the ski slopes or drive to the free or paid parking areas at the base of Peak 8 or Peak 9. The full kitchen has all the necessary tools to make meals and has a separate sitting/eating area and sun room with a ten person wood table. Additional dining seating also next to the kitchen on the eight-person wood table. The main floor sleeps six with a king, two twins and a queen sofa sleeper. A full bath is also on this level. The top floor has a loft with an overview of the main level and views from the wall of windows. 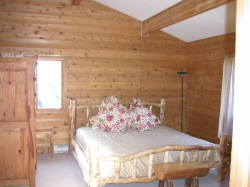 Enjoy a book in the large oversized chair or in the private master bedroom with a king bed and full restroom. The master bath has two sinks, two showers, and a bathtub. Cable TV throughout the home. New 40 plus Jet Hot tub on the deck. Gas barbecue on the deck. Private Garage. Two family room areas. Separate upstairs and downstairs access. Backs to woods. Top of Baldy mountain in Woodmoor. We are happy to answer any questions so please contact us! Balance to be paid - 30 days prior to arr to arrival.